There is never enough time for portraits on the wedding day. As a result, many couples have been opting to do a “day-after” photo session in their wedding clothes. 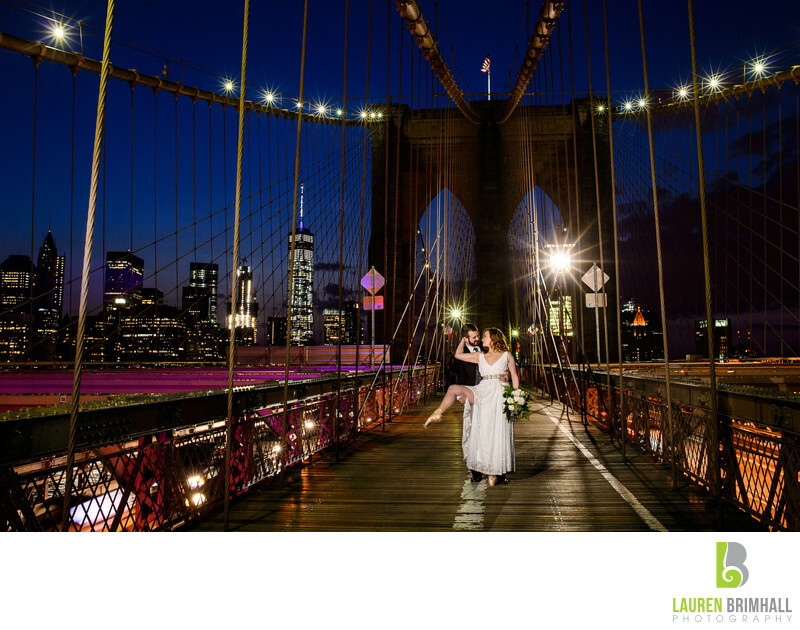 This image of a newly married bride and groom on the Brooklyn bridge at sunset was from just such a session. As the last of the pink clouds dissipated behind the historic bridge, the couple posed during a quick break in the crowds of people passing through. The bride wore pointe shoes as a head-nod to her previous days as a professional ballerina, and the image was lit with a magmod gridded speed light aimed down at the camera upper camera right. A slightly higher aperture was chosen for this image, which allows the lights on the bridge to take more of a star shape in camera, and brings the city skyline behind the couple into focus. The photographer successfully balanced the ambient light with her off-camera flash, creating a very natural look. The Brooklyn Bridge is a hybrid cable-stayed/suspension bridge connecting the boroughs of Manhattan & Brooklyn. It was completed in 1883, making it one of the oldest roadway bridges in the United States. It has since become a famous spot for couples to come and profess their eternal love by placing a lock with their names onto the cables and throwing the keys into the East River below. Location: Brooklyn Bridge, New York, NY 10038.